Government of India figures, released in the Rajya Sabha recently, have shockingly revealed that, of Gujarat’s nearly 1.59 lakh “out of school” children, 43.76 per cent are Dalits, which is one of the highest proportions in India. The revelation is particularly surprising because Gujarat has one of the lowest proportion of Dalit population in the country, less than seven per cent. United Nations Educational, Scientific, and Cultural Organization’s (UNESCO’s) Institute for Statistics defines “out of school” children as “the number of primary-school-age children not enrolled in primary or secondary school.” They include children who are not enrolled as well school dropouts. 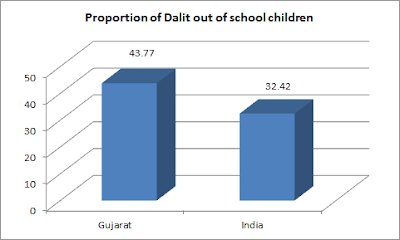 While Dalits comprise of 16.6 per cent of the country’s population, they form about 32.42 per cent of the total “out of school” children in the country, 60.64 lakh. Tamil Nadu and Punjab, both “progressive states”, have far fewer “out of school” children – as against Gujarat’s 1.59 lakh, Tamil Nadu has 57,529 and Punjab has 91,578 “out of school” children. In Bihar, there are a whopping 11.70 lakh “out of school” children, one of the highest in the country. In Tamil Nadu, Dalits constitute 20.5 per cent of the state’s population, in Punjab they constitute 31.9 per cent, and in Bihar the constitute 16 per cent. Next to Dalits, 18.93 per cent of “out of school” children in Gujarat are tribals, and 13.74 per cent are Muslims. 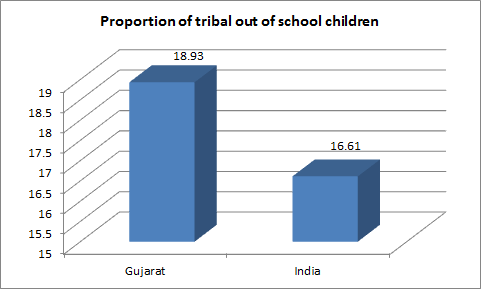 Tribals constitute about 15 per cent of the state’s population, while Muslims constitute around nine per cent. The Government of India, interestingly, has quoted a private agency to provide an answer to the question on “out of school” children – the IMRB International (formerly Indian Market Research Bureau). It is not known why it did not quote National Sample Survey (NSS) data on this. IMRB is said to be a multi-country market research, survey and business consultancy firm that offers a range of syndicated data and customized research services. Headquartered in Mumbai, with operations in over 15 countries. It is modeled on the lines of the British Market Research Bureau. The reply to a question, asked in the Rajya Sabha by CPI MP KK Ragesh, has suggested that, despite the Right to Education and Sarva Shiksha Abhiyan, about 60.64 lakh children remain out of school across the country, and a great majority of them, 71.71 per cent, are Dalits, tribals and Muslims. The reply, provided by Minister for Human Resources Smriti Irani, concerned “out of school” children in the age group 6 to 13, even as providing breakup of scheduled castes, scheduled tribes and Muslims. 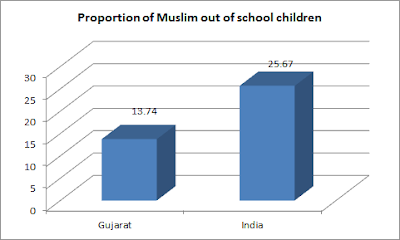 Of the total “out of school” in India, 60.64 lakh, while 32.4 per cent children are Dalits, 25.7 per cent children are Muslims and 16.6 per cent are Muslims. Uttar Pradesh tops the list of “out of school” children, with 16.12 lakh, of which 56.05 lakh, or 37.77 per cent, are Dalits. Bihar comes next, with a total number of 11.70 lakh “out of school” children, of which 52.41 lakh, or 44.81 per cent, are Dalits.